One of my personal rituals is to always, always make macaroni and cheese for myself on my birthday. It’s never quite the same from year to year, though: last year I used multi-colored vegetable shell noodles and a creamy sharp cheddar sauce. This year I decided to try a new approach, inspired by a recipe on Food52, posted by my friend Jen of the blog Last Night’s Dinner (featured in this week’s New York Times dining section, check it out!). Her original recipe is here; I failed to follow it exactly (surprise!) but I think I managed to capture the spirit of the dish. 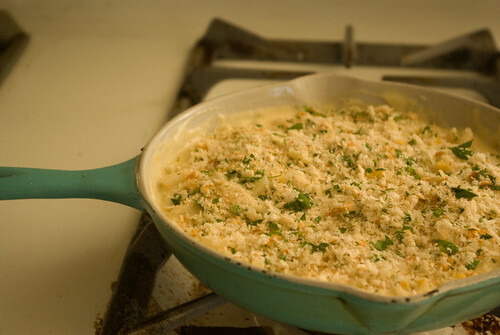 This recipe differs from my usual approach in several ways: it uses several different kinds of cheese, it has herbs, mustard powder and hot sauce for added flavor, and it’s baked with a breadcrumb topping. Much to my surprise, it was quite possibly the best mac and cheese I’ve ever eaten in my life. 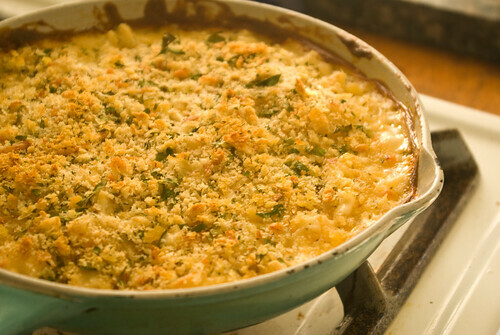 Instead of the hard cheese crust I’ve come to associate with baked macaroni and cheese, this had a delicate buttery crunch giving way to creamy, rich noodles. Instead of the cast iron pan called for in the recipe, I chose to use our medium Le Creuset pan (inherited from Jon’s grandmother) – partly because it was a better size for the scaled-down amount I was making, and partly because I was worried about taking the seasoning off our good iron pan. Le Creuset enamelled pans will come clean after anything. 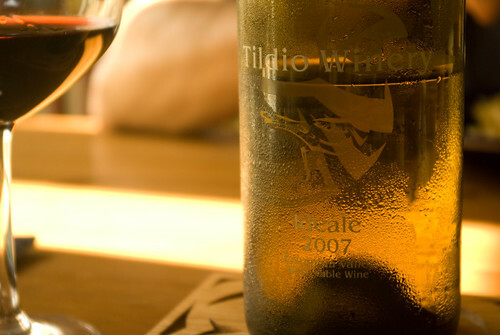 We drank a white wine from Tildio Winery (bought on our last visit to Lake Chelan) that happened to be in the fridge. Called Ideále, it’s a lightly oaked blend of Chardonnay and Viognier, and it was a magnificent match for the cheesy, lightly herbed pasta. We also had a small amount of a Spanish red wine left over from a previous meal, and it overwhelmed the macaroni something terrible. White was definitely the way to go here. This would be a fabulous dish to serve for dinner along with some sauteed greens or a sharp bitter salad. But I can recommend a big plate of it for lunch with nothing but a bottle of wine and some good company. What more do you need for a birthday lunch? Preheat the oven to 400° and put on a pot of water to boil. Cook the pasta according to its directions. Drain and set aside. 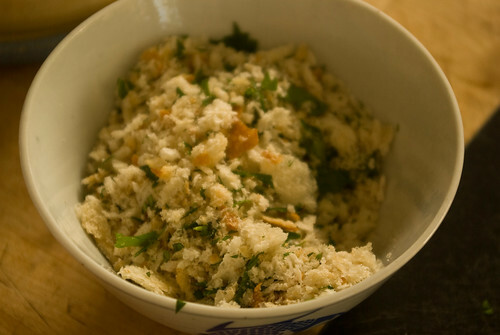 In a small bowl, combine the breadcrumbs, herbs, and parmesan. In a medium skillet, melt the butter over medium-high heat. Whisk in the flour and cook for a few minutes, until it smells toasty. Pour in the milk and whisk smooth. Let it simmer until it begins to thicken, and stir in the mustard, hot sauce and salt. 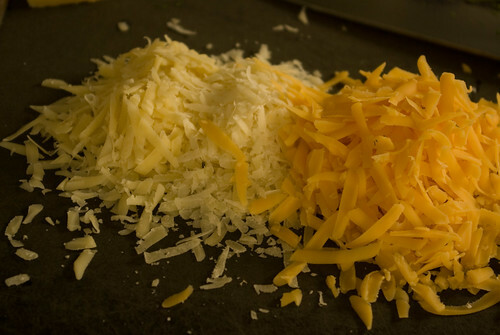 Begin adding in handfuls of cheese, stirring the sauce smooth between additions. When the cheese is all melted in, add the pasta to the skillet and fold it into the sauce. 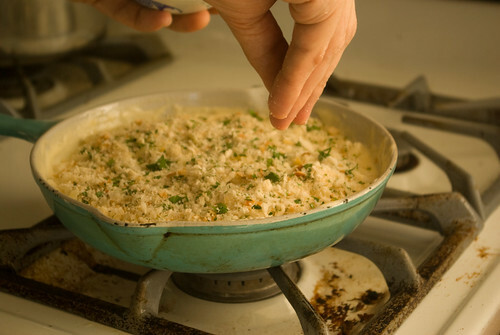 Sprinkle the breadcrumb mixture evenly over the top and pop the skillet into the oven. Bake about 25 minutes, until the topping is golden and the sauce is bubbling up around the edges. Let the pan sit for five minutes, if you can stand it, then serve. Gorgeous! This might even convert me to mac and cheese. Happy Birthday!!! Thank you! Are you not a fan of mac and cheese? I admit to being a sucker for it even when it’s not very good, but this was amazing. Mac and Cheese was always the dish I asked my mother to make me on my birthday. It’s still one of my favorites, but I rarely make anything other than my mother’s recipe! I like your ritual of making mac and cheese for yourself on your birthday. I think I will adopt it, and this will be my first recipe. 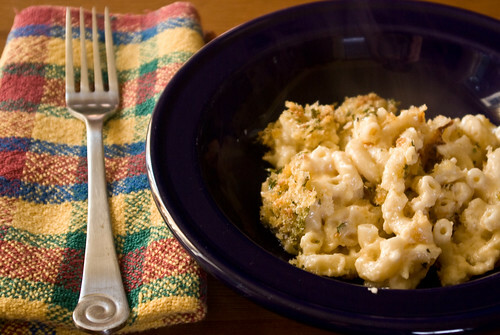 (but I think I will still use cavatappi instead of macaroni, as in my mothers recipe). Happy Birthday! Hi Talley! I never ate macaroni and cheese growing up, except at Grange potlucks and school hot lunch and such, so I never really developed a sense of what it ought to be like – which has definitely freed me up to experiment over the years. I like it lots of ways, but this was exceptional. Cavatappi would work great – I also love shell noodles for this sort of thing. How is your mother’s recipe different besides the noodle shape? First of all, how did I miss your birthday??!! Happy happy to you! As far as the iron skillet, one thing we’ve noticed is that all the dairy in the dish makes it super smooth after washing. It’s like the oils help to season it even more or something. Thanks for the recipe, Jen, it was great!